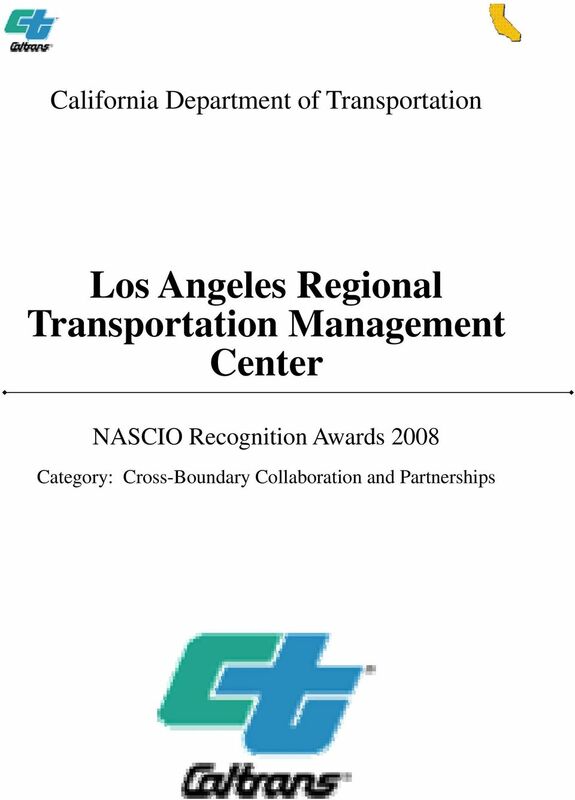 Download "Los Angeles Regional Transportation Management Center"
2 Executive Summary In October of 2007, The California Department of Transportation (Caltrans), the California Highway Patrol (CHP), and the Los Angeles County Metro opened a worldclass traffic management complex for Los Angeles and Ventura County freeways. The Los Angeles Regional Transportation Management Center (LARTMC) is a state-of-theart facility that co-locates the three government entities responsible for the management of nearly 525 miles of freeway. 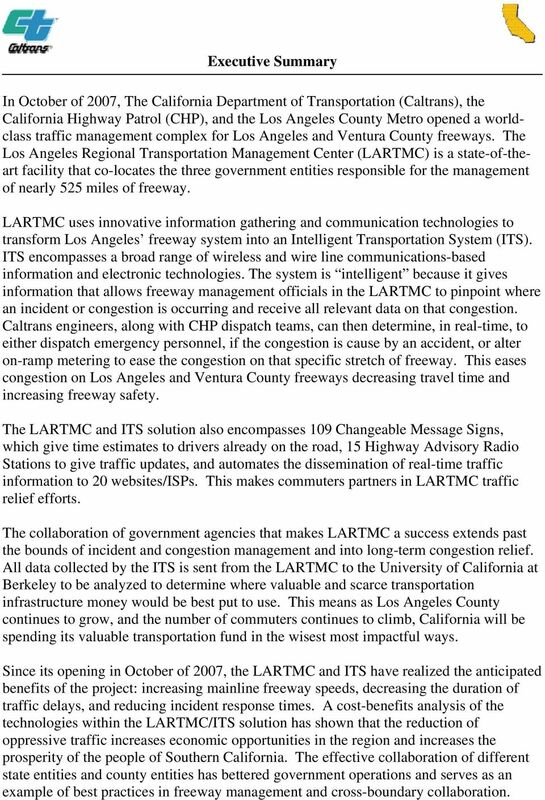 LARTMC uses innovative information gathering and communication technologies to transform Los Angeles freeway system into an Intelligent Transportation System (ITS). ITS encompasses a broad range of wireless and wire line communications-based information and electronic technologies. The system is intelligent because it gives information that allows freeway management officials in the LARTMC to pinpoint where an incident or congestion is occurring and receive all relevant data on that congestion. Caltrans engineers, along with CHP dispatch teams, can then determine, in real-time, to either dispatch emergency personnel, if the congestion is cause by an accident, or alter on-ramp metering to ease the congestion on that specific stretch of freeway. This eases congestion on Los Angeles and Ventura County freeways decreasing travel time and increasing freeway safety. The LARTMC and ITS solution also encompasses 109 Changeable Message Signs, which give time estimates to drivers already on the road, 15 Highway Advisory Radio Stations to give traffic updates, and automates the dissemination of real-time traffic information to 20 websites/isps. This makes commuters partners in LARTMC traffic relief efforts. The collaboration of government agencies that makes LARTMC a success extends past the bounds of incident and congestion management and into long-term congestion relief. All data collected by the ITS is sent from the LARTMC to the University of California at Berkeley to be analyzed to determine where valuable and scarce transportation infrastructure money would be best put to use. This means as Los Angeles County continues to grow, and the number of commuters continues to climb, California will be spending its valuable transportation fund in the wisest most impactful ways. Since its opening in October of 2007, the LARTMC and ITS have realized the anticipated benefits of the project: increasing mainline freeway speeds, decreasing the duration of traffic delays, and reducing incident response times. 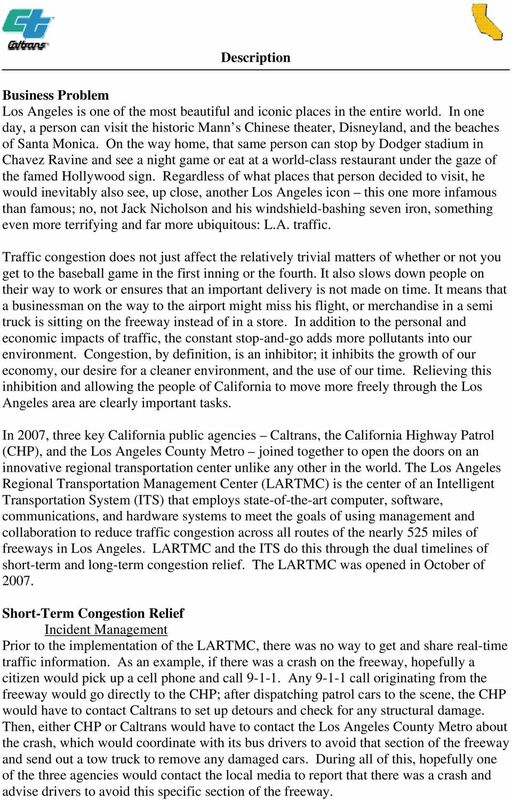 A cost-benefits analysis of the technologies within the LARTMC/ITS solution has shown that the reduction of oppressive traffic increases economic opportunities in the region and increases the prosperity of the people of Southern California. The effective collaboration of different state entities and county entities has bettered government operations and serves as an example of best practices in freeway management and cross-boundary collaboration. 3 Description Business Problem Los Angeles is one of the most beautiful and iconic places in the entire world. In one day, a person can visit the historic Mann s Chinese theater, Disneyland, and the beaches of Santa Monica. On the way home, that same person can stop by Dodger stadium in Chavez Ravine and see a night game or eat at a world-class restaurant under the gaze of the famed Hollywood sign. Regardless of what places that person decided to visit, he would inevitably also see, up close, another Los Angeles icon this one more infamous than famous; no, not Jack Nicholson and his windshield-bashing seven iron, something even more terrifying and far more ubiquitous: L.A. traffic. Traffic congestion does not just affect the relatively trivial matters of whether or not you get to the baseball game in the first inning or the fourth. It also slows down people on their way to work or ensures that an important delivery is not made on time. It means that a businessman on the way to the airport might miss his flight, or merchandise in a semi truck is sitting on the freeway instead of in a store. In addition to the personal and economic impacts of traffic, the constant stop-and-go adds more pollutants into our environment. Congestion, by definition, is an inhibitor; it inhibits the growth of our economy, our desire for a cleaner environment, and the use of our time. Relieving this inhibition and allowing the people of California to move more freely through the Los Angeles area are clearly important tasks. In 2007, three key California public agencies Caltrans, the California Highway Patrol (CHP), and the Los Angeles County Metro joined together to open the doors on an innovative regional transportation center unlike any other in the world. The Los Angeles Regional Transportation Management Center (LARTMC) is the center of an Intelligent Transportation System (ITS) that employs state-of-the-art computer, software, communications, and hardware systems to meet the goals of using management and collaboration to reduce traffic congestion across all routes of the nearly 525 miles of freeways in Los Angeles. LARTMC and the ITS do this through the dual timelines of short-term and long-term congestion relief. The LARTMC was opened in October of Short-Term Congestion Relief Incident Management Prior to the implementation of the LARTMC, there was no way to get and share real-time traffic information. As an example, if there was a crash on the freeway, hopefully a citizen would pick up a cell phone and call Any call originating from the freeway would go directly to the CHP; after dispatching patrol cars to the scene, the CHP would have to contact Caltrans to set up detours and check for any structural damage. Then, either CHP or Caltrans would have to contact the Los Angeles County Metro about the crash, which would coordinate with its bus drivers to avoid that section of the freeway and send out a tow truck to remove any damaged cars. During all of this, hopefully one of the three agencies would contact the local media to report that there was a crash and advise drivers to avoid this specific section of the freeway. 4 As you can see, there were a lot of contingencies and an extensive amount of labor surrounding incident response protocol, and while this interagency waltz was being played out, traffic would be building up behind the crash. You will never be able to completely eliminate traffic accidents, but learning how to effectively manage them gives administrative agencies the best chance of minimizing the delays and negative externalities surrounding these incidents. Increasing the information one could gather about traffic conditions and decreasing coordination times between Caltrans, CHP, the Los Angeles County Metro and drivers are the two key steps in effective incident management and, consequently, effective short-term congestion relief. First, it cannot be understated that the mere co-location of these three agencies in the LARTMC is an important step in breaking down the cross-agencies boundaries that stifle collaboration. Second, LARTMC made investments in innovative technologies that increase data gathering capability and the ability for government to communicate with commuters. 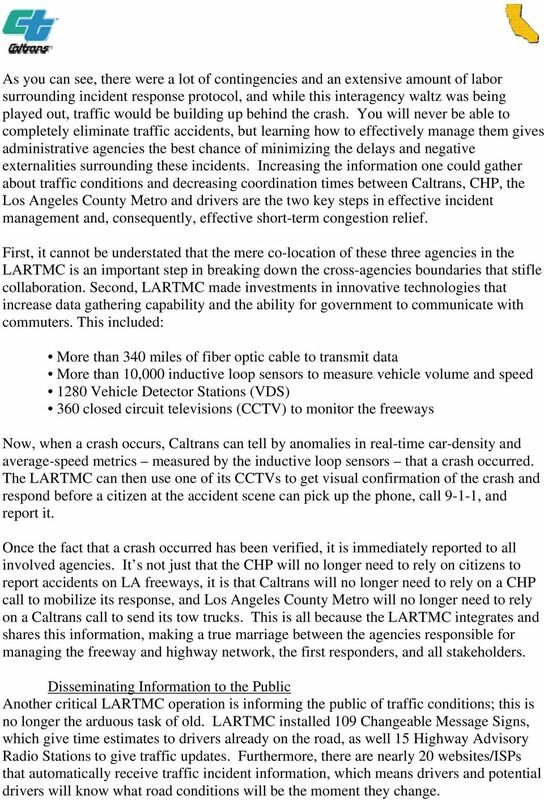 This included: More than 340 miles of fiber optic cable to transmit data More than 10,000 inductive loop sensors to measure vehicle volume and speed 1280 Vehicle Detector Stations (VDS) 360 closed circuit televisions (CCTV) to monitor the freeways Now, when a crash occurs, Caltrans can tell by anomalies in real-time car-density and average-speed metrics measured by the inductive loop sensors that a crash occurred. The LARTMC can then use one of its CCTVs to get visual confirmation of the crash and respond before a citizen at the accident scene can pick up the phone, call 9-1-1, and report it. Once the fact that a crash occurred has been verified, it is immediately reported to all involved agencies. It s not just that the CHP will no longer need to rely on citizens to report accidents on LA freeways, it is that Caltrans will no longer need to rely on a CHP call to mobilize its response, and Los Angeles County Metro will no longer need to rely on a Caltrans call to send its tow trucks. This is all because the LARTMC integrates and shares this information, making a true marriage between the agencies responsible for managing the freeway and highway network, the first responders, and all stakeholders. Disseminating Information to the Public Another critical LARTMC operation is informing the public of traffic conditions; this is no longer the arduous task of old. LARTMC installed 109 Changeable Message Signs, which give time estimates to drivers already on the road, as well 15 Highway Advisory Radio Stations to give traffic updates. Furthermore, there are nearly 20 websites/isps that automatically receive traffic incident information, which means drivers and potential drivers will know what road conditions will be the moment they change. 5 Controlling Traffic Flow In addition to the aforementioned information-gathering infrastructure, LARTMC also installed 960 Ramp Metering Stations (RMS). These RMS use a whole host of variables including local traffic conditions near the onramp, traffic conditions on the freeway, time of day, and subsequent changes in freeway capability to meter the time between letting new cars on the freeways. This facilitates better merging and traffic flow, which decreases the likelihood of an accident. Long-Term Congestion Relief Los Angeles County s current transportation infrastructure supports more than 9.6 million people who travel more than 92 million vehicle miles every day. Estimates predict that by 2025, this usage will increase by 42 percent. Obviously, outside of incident and road management, an increase in the actual capacity of freeways will need to be realized in order to keep pace with LA County s growing population. This is not just a priority of the LARTMC but also of the Governor. In 2006, the Governor championed a $42 billion plan for new infrastructure, but figuring out how to spend this new infrastructure money is just as important as securing the funds. Caltrans uses its datagathering system and collaborates with UC Berkeley to analyze that data and find where new roads and road expansions are most needed. This state-of-the-art Transportation Management Center is equipped with the latest technology to allow us to better serve the public by coordinating our resources to effectively manage traffic in the Los Angeles basin. 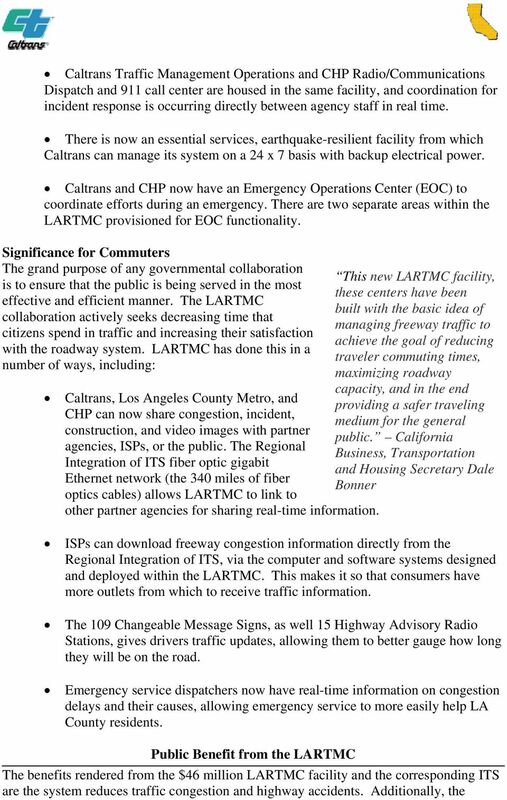 CHP Commissioner Joseph Farrow Significance The stakeholders that benefit from the LARTMC are the three agencies involved (CHP, Caltrans, and LA County Metro), Los Angeles County businesses and residents, and anybody who uses a LA or Ventura County freeway. Significance to Caltrans, CHP, and LA County Metro The LARTMC serves 43 distinct government functions and was designed with the technologies to support joint operations and act as the center for Intelligent Transportation Systems (ITS) and Emergency Response operations for the next 30 years. The collaboration that led to the development and design of the LARTMC has improved operations for all three principle government agencies, including: All freeways, arterial signal, CHP, transit, planned lane closure, and Smart Corridor systems are integrated together. Caltrans, CHP, and LA County Metro are freely sharing real-time transportation data and using one integrated application to help improve overall corridor and regional transportation operations. 7 collaboration and co-location of the Department of Transportation (Caltrans), California Highway Patrol (CHP), and Los Angeles County Metropolitan Transportation Authority (Metro) provides savings in cost overruns for duplication of services and facilities. 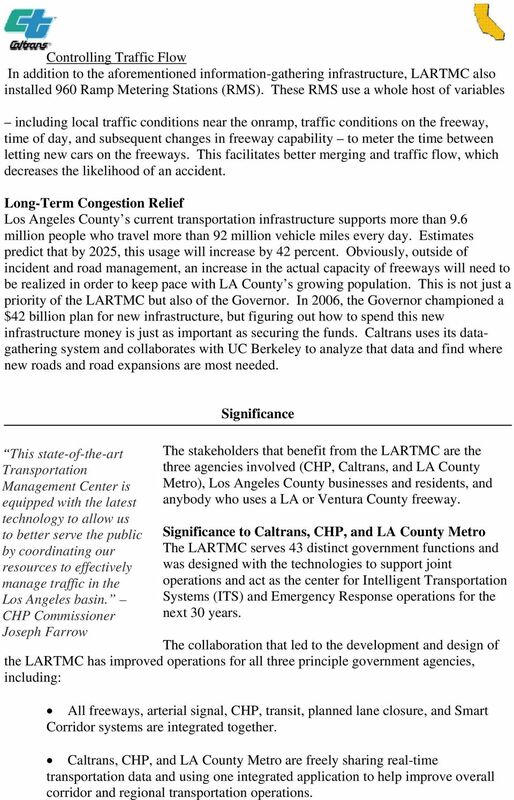 Besides the cost avoidance realized by not having each government entity build its own facility, the LARTMC has also seen a return on investment by improving the management of traffic in Los Angeles County. 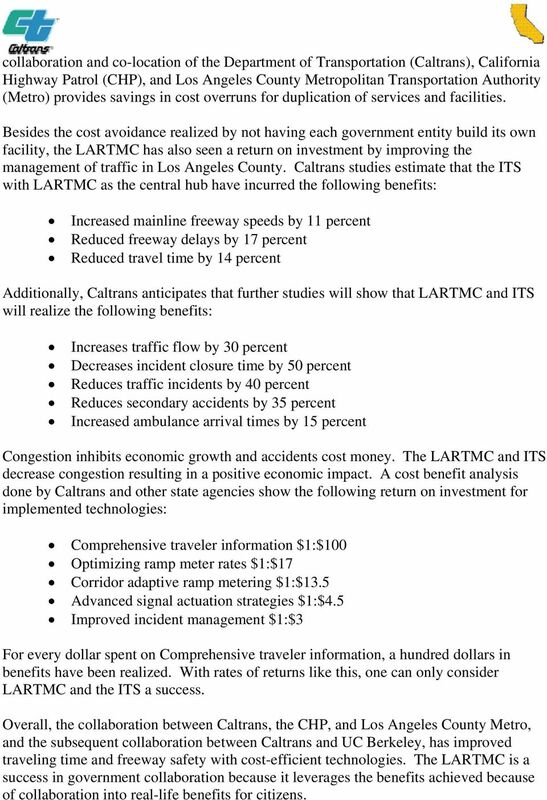 Caltrans studies estimate that the ITS with LARTMC as the central hub have incurred the following benefits: Increased mainline freeway speeds by 11 percent Reduced freeway delays by 17 percent Reduced travel time by 14 percent Additionally, Caltrans anticipates that further studies will show that LARTMC and ITS will realize the following benefits: Increases traffic flow by 30 percent Decreases incident closure time by 50 percent Reduces traffic incidents by 40 percent Reduces secondary accidents by 35 percent Increased ambulance arrival times by 15 percent Congestion inhibits economic growth and accidents cost money. The LARTMC and ITS decrease congestion resulting in a positive economic impact. A cost benefit analysis done by Caltrans and other state agencies show the following return on investment for implemented technologies: Comprehensive traveler information $1:$100 Optimizing ramp meter rates $1:$17 Corridor adaptive ramp metering $1:$13.5 Advanced signal actuation strategies $1:$4.5 Improved incident management $1:$3 For every dollar spent on Comprehensive traveler information, a hundred dollars in benefits have been realized. With rates of returns like this, one can only consider LARTMC and the ITS a success. Overall, the collaboration between Caltrans, the CHP, and Los Angeles County Metro, and the subsequent collaboration between Caltrans and UC Berkeley, has improved traveling time and freeway safety with cost-efficient technologies. The LARTMC is a success in government collaboration because it leverages the benefits achieved because of collaboration into real-life benefits for citizens. This paper has been mechanically scanned. Some errors may have been inadvertently introduced. Mobile Trailer Works. Keep on Trucking with MOTOTRBO & GPS! Time is Money.